Taipei, Aug. 9 (CNA) The outgoing head of the European Economic and Trade Office in Taiwan (EETO), Frederic Laplanche, has a 20-year love affair with Taiwan that he said will leave him hooked to the country even though he is stepping down from his current post soon. In an exclusive interview with CNA prior to his departure at the end of this month, Laplanche said that when he first came to Taiwan in 1995 as a student, his purpose was to study Taiwan's democratization. He said he still vividly remembers Taipei when he arrived in July of that year -- a hot and humid city bustling with the construction of the rapid transit system. The change since then has been dramatic, he said, noting that Taipei now has a comfortable living environment with its many coffee shops and the rise in people's living standards. People here now also care very much about the arts and environmental issues, Laplanche said. From the perspectives of a democratic society and economic development, "I would say European Union and Taiwan are very close," he said. He has been most impressed by the rapid development of Taiwan's democracy, and he admires Taiwan's democratic institutions that ensure efficient elections and protect freedom of speech and human rights. Where Taiwan still falls short, Laplanche believes, is on the death penalty, an issue where he sees plenty of room for improvement in Taiwan, which has stuck to capital punishment because of wide popular support. Laplanche noted another drawback in Taiwan that also exists in Europe -- the tendency of people to express dissatisfaction with a government and distrust it six months after electing new leadership, leading to a gap between the rulers and the ruled. 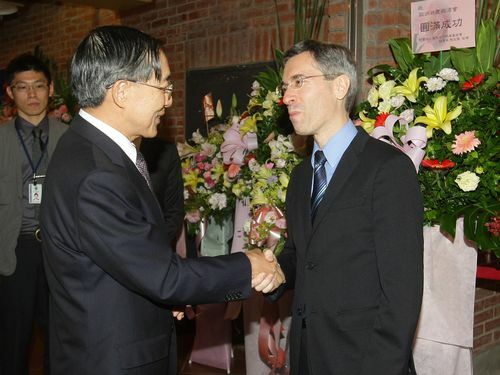 Taiwanese and European Union member countries and their people are "in the same situation," he said. Laplanche, who is fluent in English, French and Mandarin, told CNA that one of the factors that brought him to Taiwan 20 years ago was his friendship with a Taiwanese girl, who later became his life partner. He served as EETO Taipei's deputy director from 2004 to 2008, and he has headed the European Economic and Trade Office since 2011, during which time he has promoted economic, trade and personnel exchanges between the EU and Taiwan. Laplanche has been particularly active in promoting NGO exchanges between the EU and his host country, covering such areas as consumer rights, environmental protection and LGBT rights. He said the EU will cooperate with Taiwan in October in the LGBT area because Taiwan's friendly attitude toward homosexual groups can serve as an example in protecting LGBT rights across Asia. Though he is not happy to be leaving Taiwan, he stressed that he was not leaving for good. "I will come back, just not for work."